Here's an Italian style way to eat a summery Greek salad or dip: Bruschetta, of course is a snack of grilled Italian bread topped with something yummy. In this case it's melitsano(eggplant)salata(salad). This Greek eggplant salad is the best I know if. I’m not a fan of the Italian sweet and sour eggplant caponata, but this Greek dish really has me. Try it on some grilled Italian bread. Yum! **I think dishes with raw onion taste better if the onion is soaked in cold water and drained first. The bright, zingy onion flavor remains but the overpowering, sometimes acrid taste is washed away before it ever gets the chance to ruin your dish. Pre-heat your oven to 350F. Leave the eggplant stem attached but pull the excess leafy-green cap off so that all of the eggplant skin is exposed. Prick the skin in several places with a knife so that steam can escape without the eggplant exploding in the oven. Place the eggplant on a cookie sheet and put in the oven for about 1 hour. Cook until the eggplant is uniformly soft and the skin has turned from purple to brown. Remove from oven. Let cool slightly. As soon as you can handle it, slice the eggplant in half longways. Scoop out all the meat with a large spoon, chop roughly, salt and place in a large mesh strainer over a recipient. Cover the eggplant with a plate and weigh it down. I use a full glass of water on top of the plate as a weight. Let stand for at least another hour until the eggplant has let go of a lot of it’s juices. Music to drain eggplant by: The Shins "New Slang". I just showed one of my English classes the film, "Garden State" and this song, featured in the film, has been running in my head ever since. Meanwhile chop, mince and mash the other ingredients. When the eggplant is ready, add everything together in a serving bowl. It tastes best after macerating together for at least an hour or 2. Serve at room temperature or chilled. I like the sounds of this recipe. Yum! I'm adding it to my list. Y'know, I'm just wondering how much eggplants cost over there cos I've forgotten. They are ridiculously expensive in Hawaii and anyway, the ones I see the most are the long, narrow asian ones. That sounds great, Susan. I've detonated my share of eggplants by forgetting to pierce them. For whatever reason, I don't really like anything with tomatoes in it chilled. But since I'd probably sit there and eat an entire loaf of grilled bread topped with this, no worries. Tomatoes and eggplants are going to be coming into season round here in a month or so...can't wait to do this one. okay, i've never liked raw onion (except sometimes a vidalia) and susan comes along with this SO SIMPLE way of making them good. soak 'em in water. all these years i've picked out raw onions, and excluded them from recipes, when all along i could have been SOAKING them? oh no no no no no. IT'S TOO EASY!!!!!! sigh. Thanks for the recipe! It looks great, and a good way for me to use eggplant (I'm always looking for new eggplant ideas)! You don't like caponata though? Oh, I love it! Hi Expat and Paz, Try it and let me know how it turns out. Rowena, I've heard about how expensive things can be on tropical islands. Guess you'll have to wait til you get back to Italy to experiment with eggplant and chocolate. How was that BTW? Did you like it? I had a kalamata olive chocolate truffle once from Vosges. It was actually worse than it sounds. Hello Melissa, I hope the soaking works for you. Another thing would be to never refrigerate a dish that has raw onion. Somehow a night in the fridge can make the left-overs nasty. Jackie, Well, maybe you can convince me. 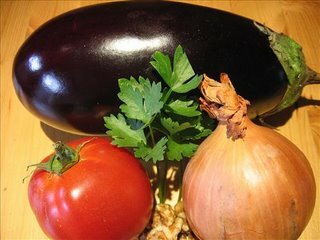 Do you have any good caponata recipes?